What is Youth Culture Killed My Dog? 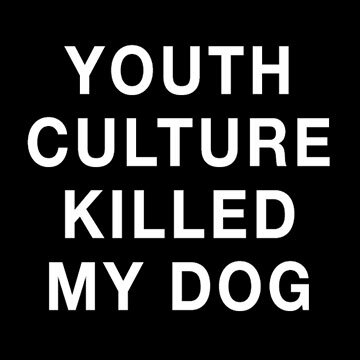 Youth Culture Killed My Dog (YCKMD) is the internet’s most necessary podcast. YCKMD is nominally about American popular culture. It is hosted by a group of friends who have been sharing their opinions on the internet since the turn of the century – mostly at a now retired website-later-blog Blurred Productions (2002 – 2011). Back in the day we wrote mostly about comics, video games, and other geeky stuff. Recently we decided to “get the band back together,” so to speak, and form this podcast. In each episode we swap stories, jokes, and jibes while talking about what we love and hate in current American popular culture – television, movies, comics, and video games. Our regular hosts are Roy Rogers, Jeffrey Kusterbeck, and (as of episode five) Christopher Fannon. Tyler Oyler appeared in our first two episodes and as of episode three we added Christian Brown to our roster of hosts! These four guys have known each other for over a decade. As of our tenth episode we have added a special feature on the Legend of Korra featuring Roy along with new hosts Melissa Rogers, Patrick Colan, and Vanessa Rees. Our KorraCasters contribute while Korra is on-air. We hope to add more hosts soon. YCKMD itself is hosted at adulthoodpending.com, which is Roy’s personal website and blog. Where can I download an episode? Our feed can be found here. You can also download episodes, or subscribe, through our iTunes feed. We are also now on Tumblr. How often will episodes go up? We hope to be a bi-weekly podcast (twice a month). Perhaps more, maybe less. We’ll see! Where can I leave comments/feedback/complaints? You can leave feedback in the comments section of a particular episode or e-mail us at yckmdpodcast[at@at]gmail.com. What’s up with the sound quality? We are just getting on our feet. We’re hoping to improve our technical and audio quality over time. Constructive tips and tricks are always welcome. Our theme music is Bamboozled Again! by C.P.Bryan provided by freesoundtrackmusic.com. Where does the weird title for this podcast come from? The song Youth Culture Killed My Dog by They Might Be Giants. The reason should be obvious enough. Ok. Honest question. What is the point of all this? To have fun and give you, dear listener, a laugh or two and maybe some insight. But mostly to just to have fun.